Dents and dings on your car aren’t only eyesores, they can indicate bigger, unseen problems. They also drag down the resale value of your vehicle. That’s why you should choose an auto body expert that can restore your vehicle properly. 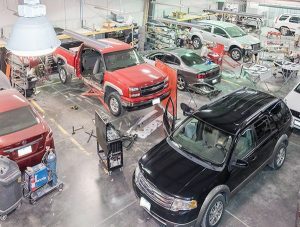 Choose an auto body shop with vast experience in body repair for your vehicle. For example, Great Plains Auto Body offers repair services backed by more than 25 years of hands-on experience. We’re at the forefront of new automotive technology. We provide auto body repair services right the first time. How? Because we use the tools appropriate for your particular make and model. There’s more to auto body repair services than just making your car look good again. It’s important to make sure other parts of your vehicle weren’t also damaged in the collision. That’s why something like dent repair shouldn’t be a DIY project. After a collision, consult with your insurance company. Make sure your vehicle gets a full inspection from a reputable repair shop. Great Plains Auto Body is well-versed in restoring vehicles to their former glory. You don’t necessarily need to get into a collision to dent up your car. Something as simple as a misjudged pull up to a drive-up ATM can leave you needing a repair. No matter what caused those unsightly dents, Great Plains Auto Body will fix them like new.